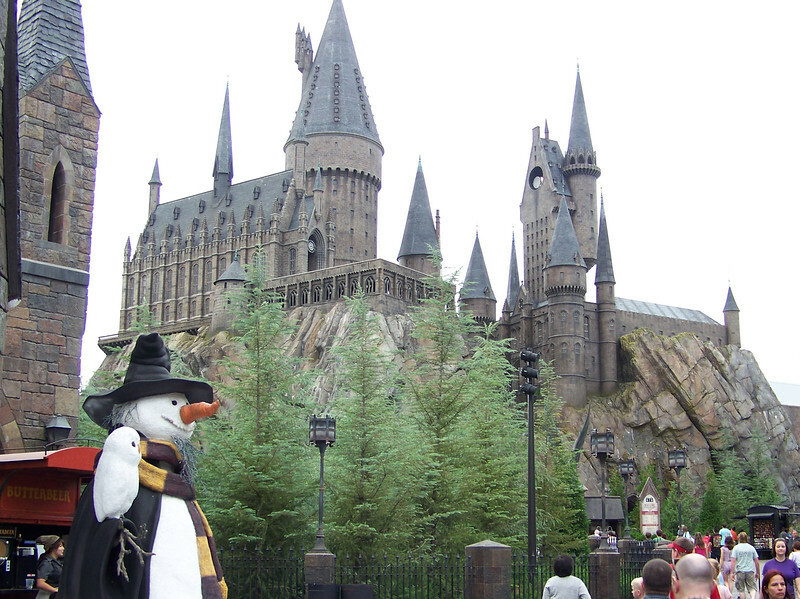 Our first look at the new Harry Potter land. 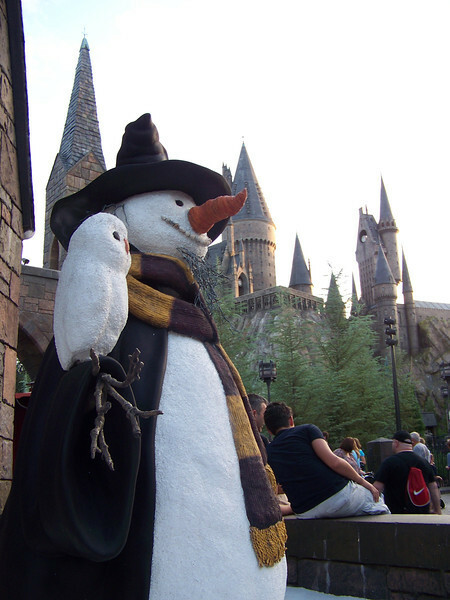 The spires of Hogwarts are in the background behind the snow wizard. 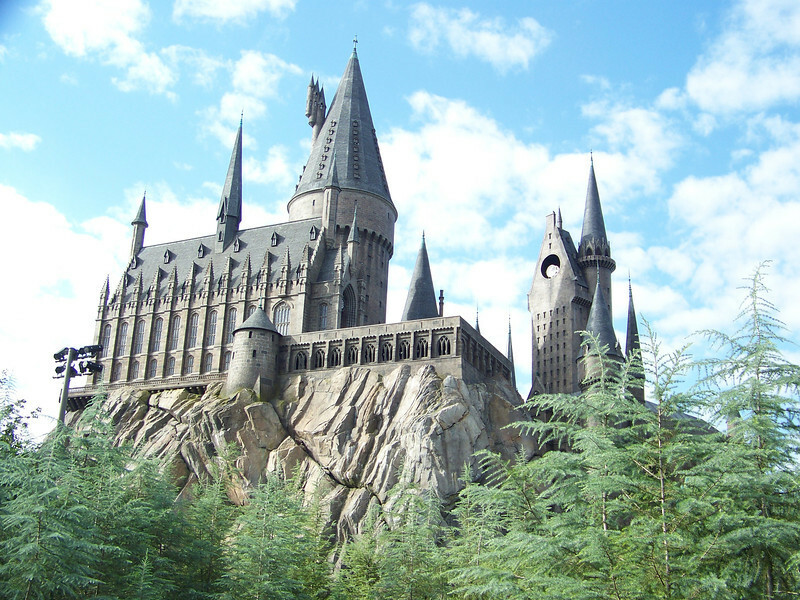 Hogwarts School of Witchcraft and Wizardry. 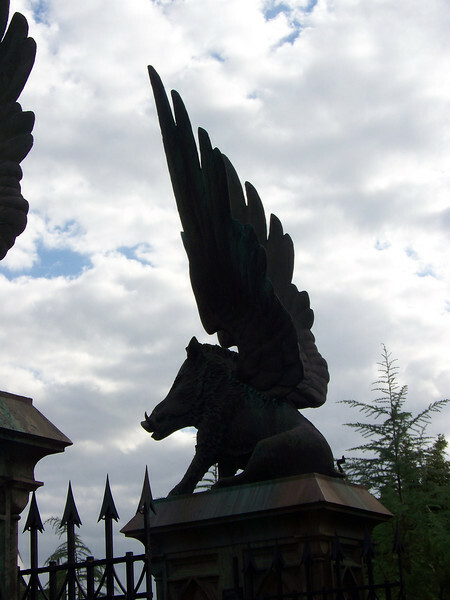 Silhouette of a boar-shaped gargoyle on the gates of Hogwarts. 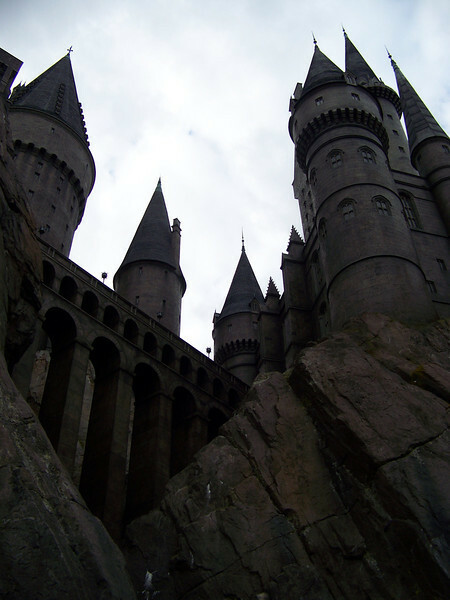 Looking up from the base of Hogwarts. 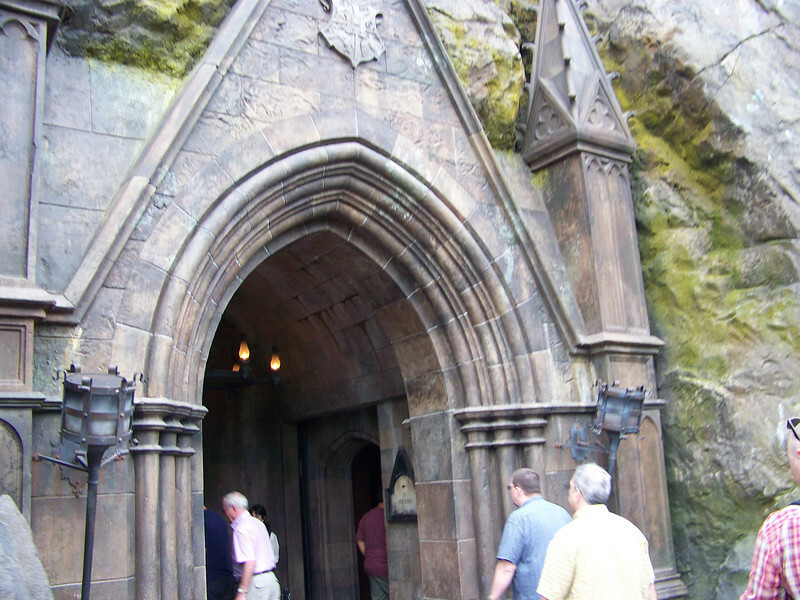 The queue for the attraction inside Hogwarts (called "Harry Potter and the Forbidden Journey") began here. 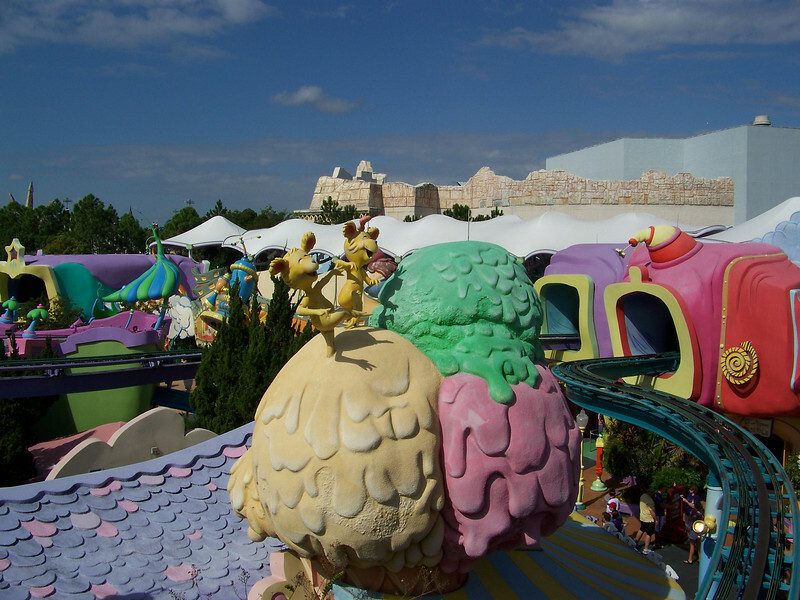 I knew in advance that I wouldn't be riding it because of the size restrictions on the ride's restraints. However, it's totally worth going through the long and incredibly-detailed queue, which is basically a tour of Hogwarts itself. Let's go! 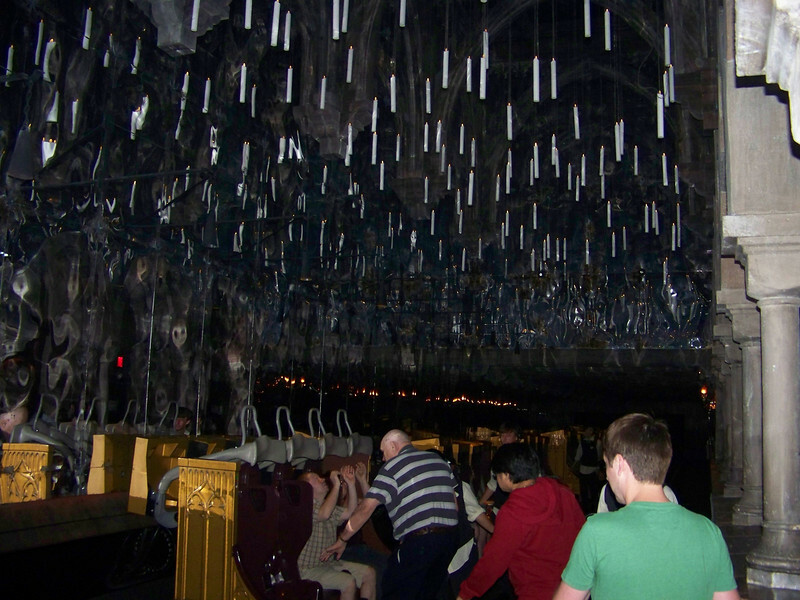 The first part of the queue wound through the lower levels of Hogwarts castle (the dungeons, if you will). You passed a number of landmarks and objects from the books, including this statue of the one-eyed witch. 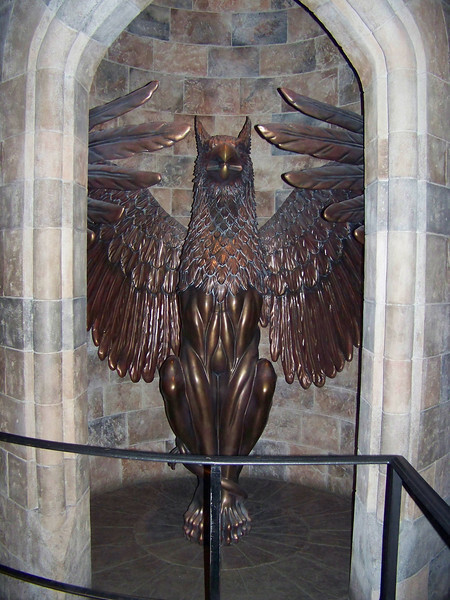 In the books, this statue hides a passageway that will take you to the basement of Honeydukes! 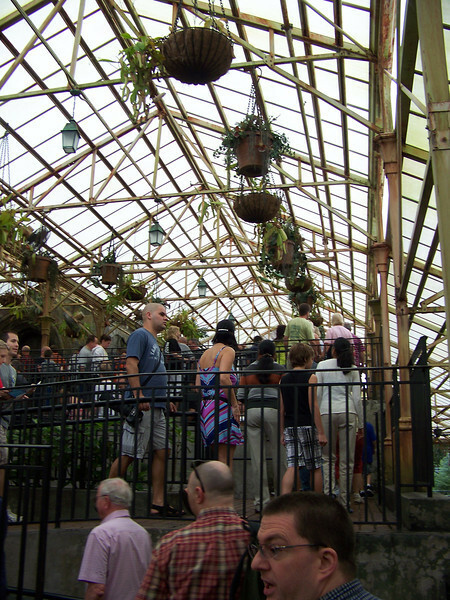 The queue then went outside and through the greenhouses behind Hogwarts before entering the school itself. There were more screaming Mandrakes in this area. 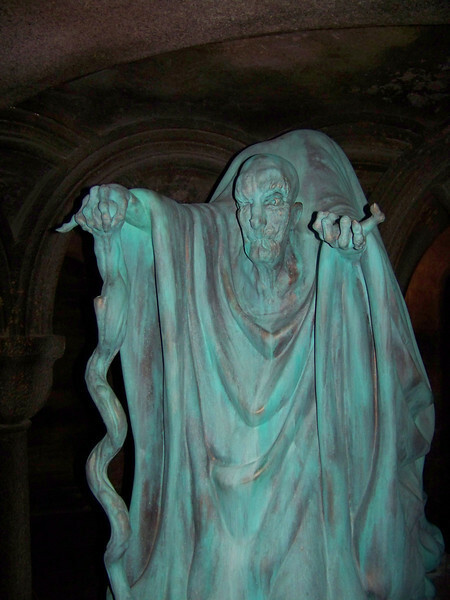 Once inside, one of the first things you passed was this statue of the architect of Hogwarts. 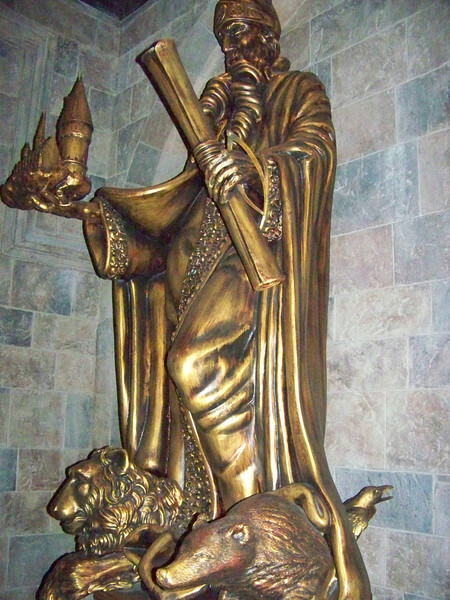 This never-named man is shown holding a model of the building and a scroll of plans, with the four house symbols at his feet. 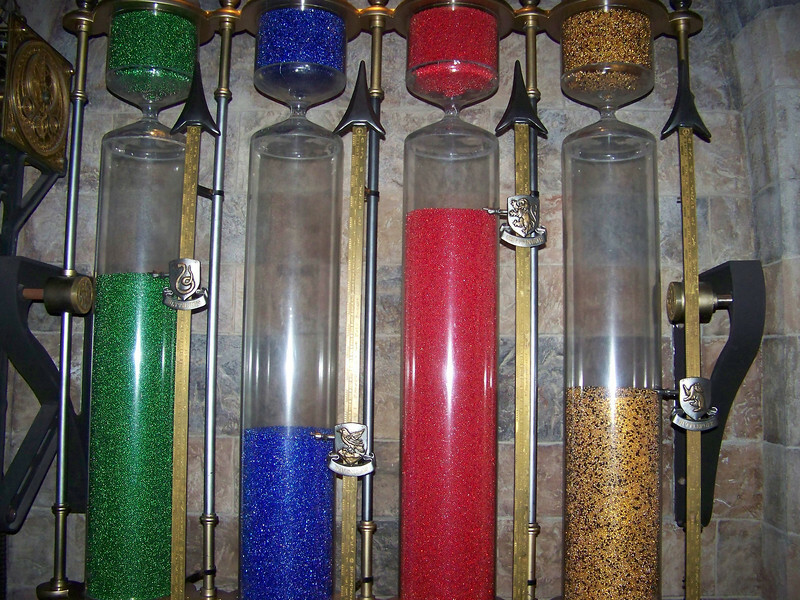 The little crystals in these tubes kept track of the points earned by each of the four Hogwarts houses. As you can see, good old Gryffindor (red) is currently in the lead. The queue then passed through a very tall portrait gallery, where many of the paintings moved and talked! 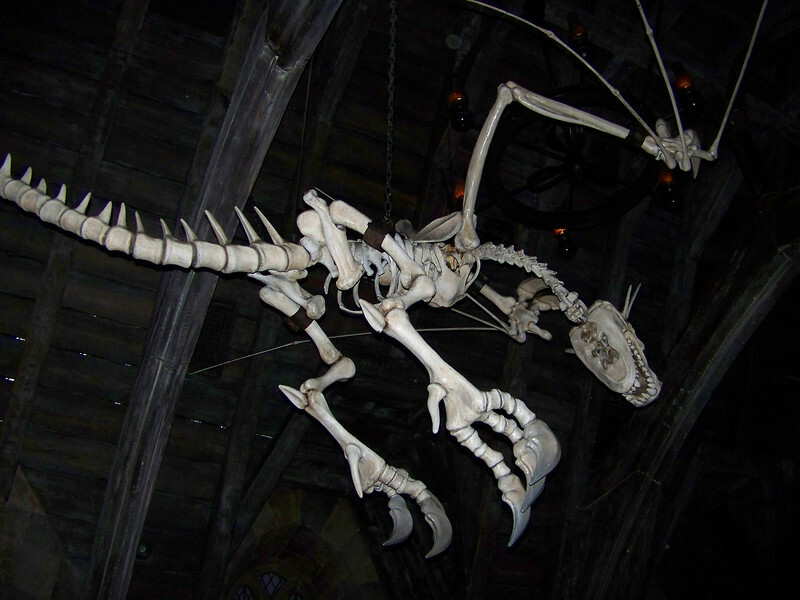 A dragon's skeleton was suspended above the queue. I believe this was in the Defense Against the Dark Arts classroom. 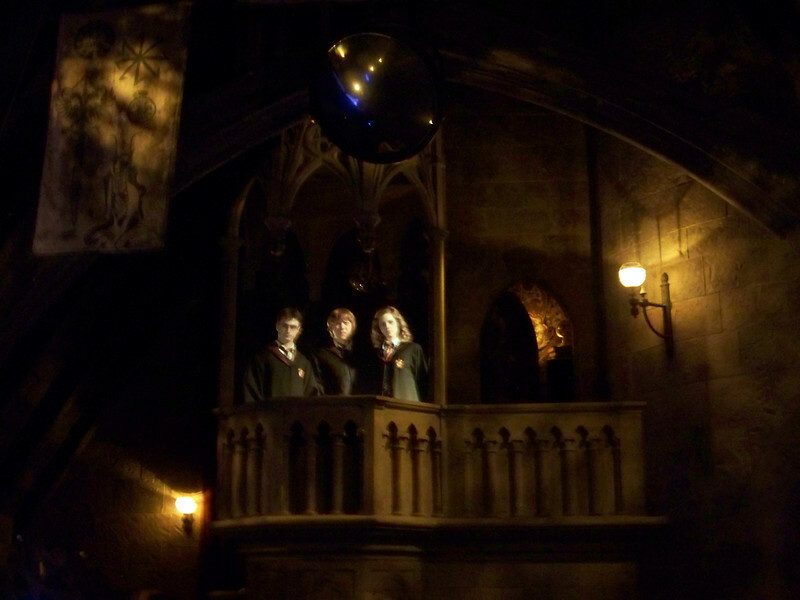 Harry, Ron, and Hermione appeared on the balcony of the Defense Against the Dark Arts classroom via a very convincing projection--it really looked like they were up there! 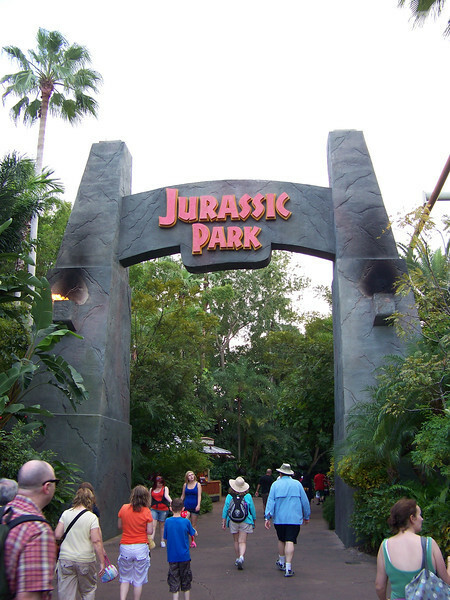 They had some words of advice for us, which helped to set up the storyline of the attraction. Dumbledore made a similar appearance earlier in the queue, but I didn't get a picture of him. 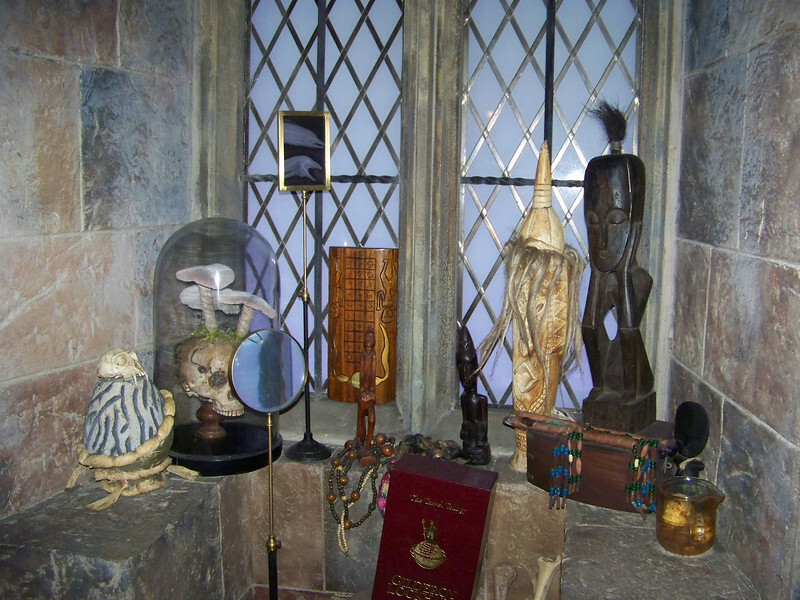 Assorted bizarre artifacts were displayed around the sides of the Defense Against the Dark Arts classroom. 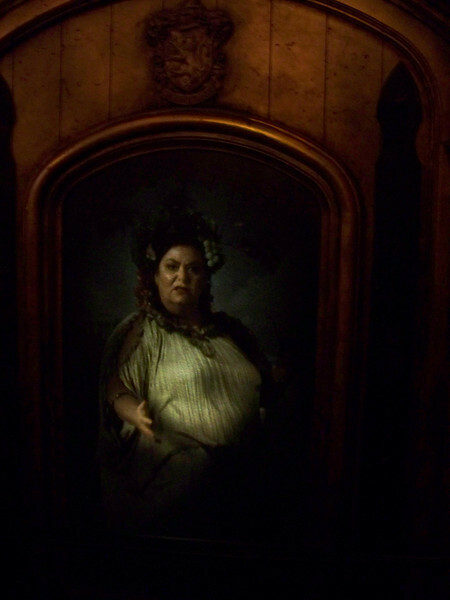 A little further on, we passed the portrait of the fat lady (British actress Dawn French) who guards the entrance to the Gryffindor dormitories. She also talked and moved. Dave and I used the "chicken exit" to get out of the queue, and found ourselves right by the load and unload area for the ride (seen here). 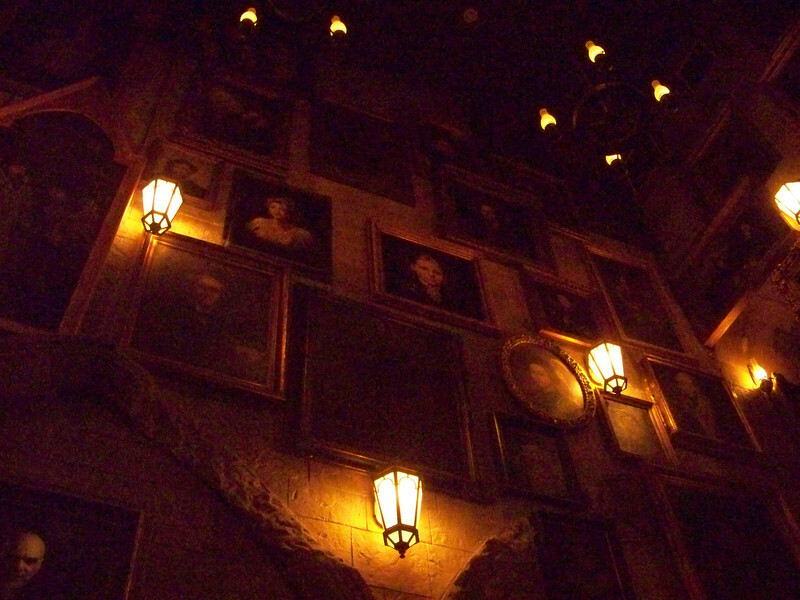 As a result, we missed the very last part of the queue, which featured an animatronic version of the Sorting Hat. I accidentally took this shot with the flash, which kind of spoils the illusion seen in the next shot. To the eye (and without the flash on my camera), the loading area looked very magical. 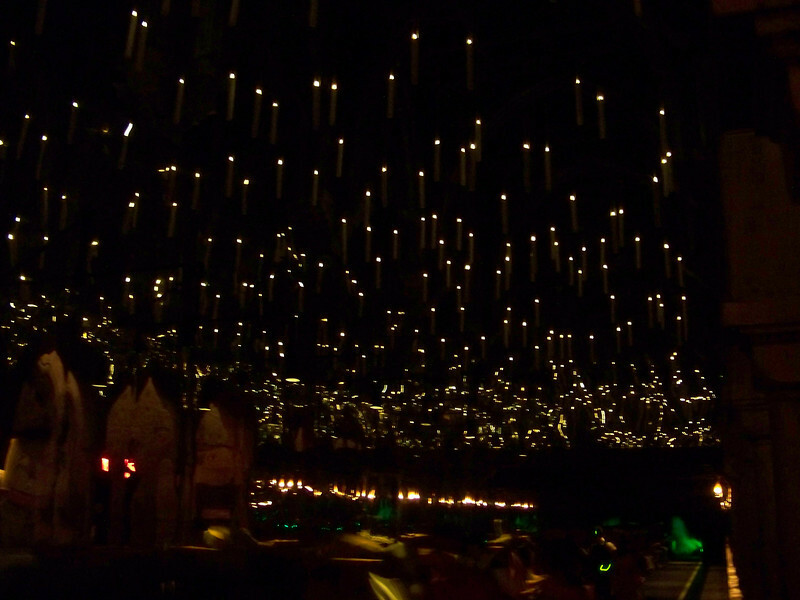 I liked the effect of all the candles floating overhead. I'm not sure why my camera didn't focus properly for this shot. Here's Pat and Jeff (at left, with his back turned) about to board for their first ride. 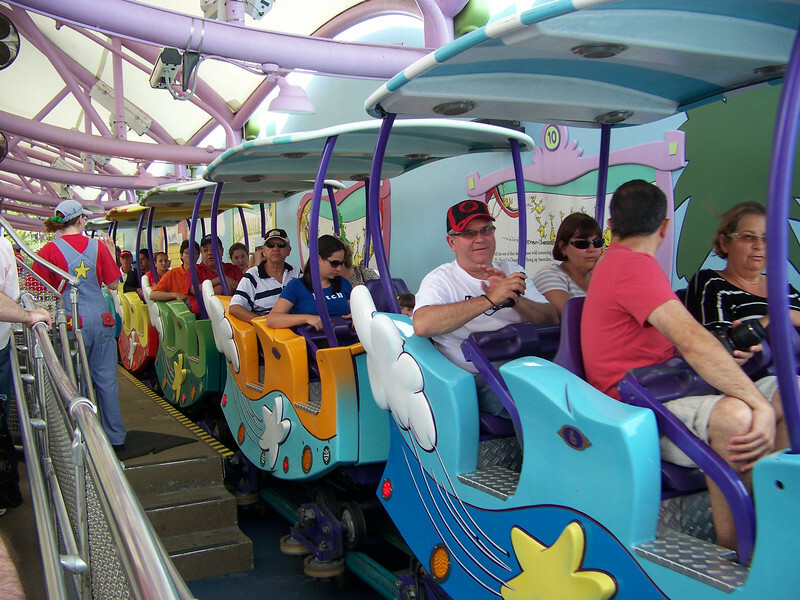 While Pat and Jeff were on it, the ride briefly stopped a couple of times. 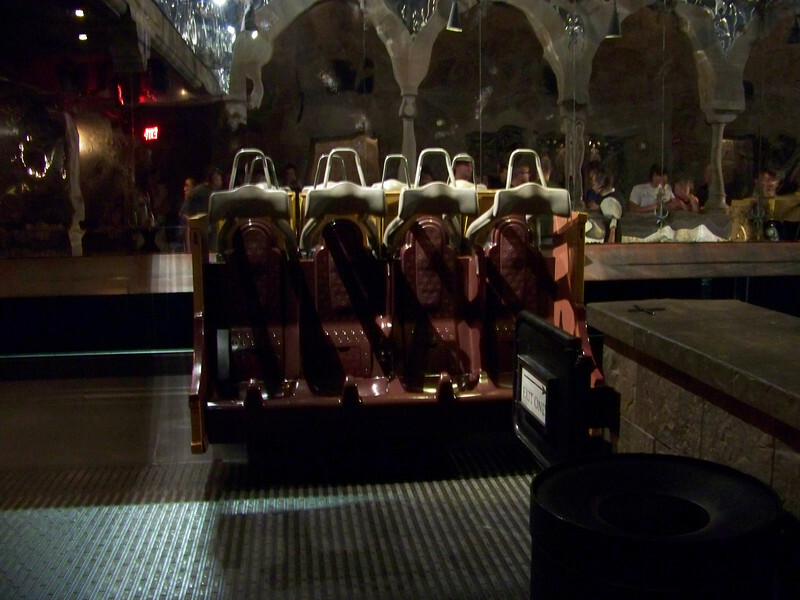 That made the emergency lights come on which gave me a great opportunity to get a clear shot of the ride vehicle. Each four-seater was attached to a robotic arm which can move in almost any direction. Here's a short video I found online that shows how similar technology was used at an Innoventions exhibit at Epcot (except there the base of the arm was stationary; here it travels along a track through the ride building). 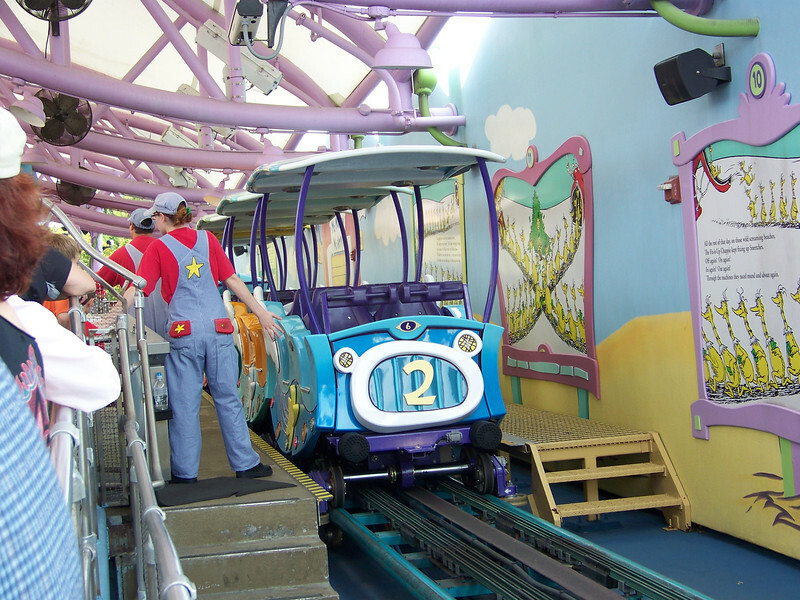 In this ride, you traveled through three-dimensional sets with animatronics (dragons, spiders, the whomping willow), and you also seamlessly interacted with movie screens, like a motion simulator. The filmed sequences featured members of the original movie cast. Here's a great video I found that shows the whole ride. 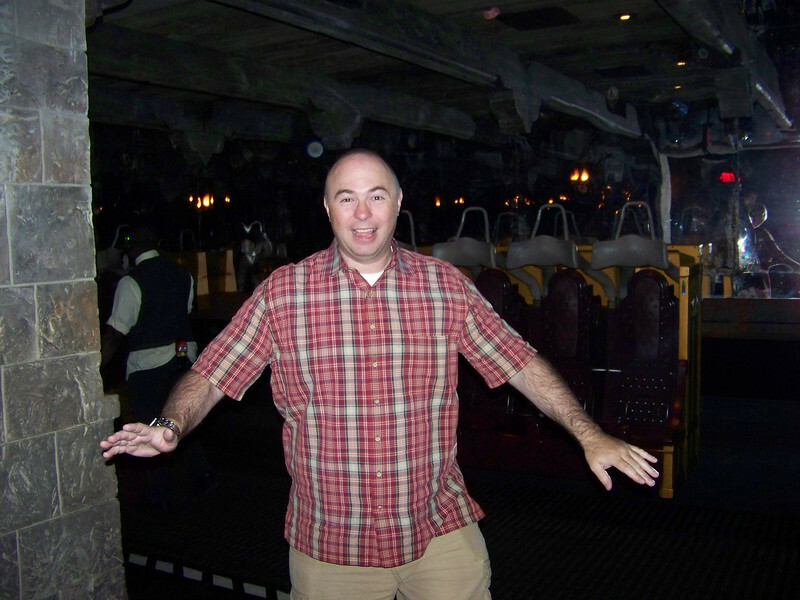 Here's Pat coming off the ride for the first time. He gave it a big thumbs up! 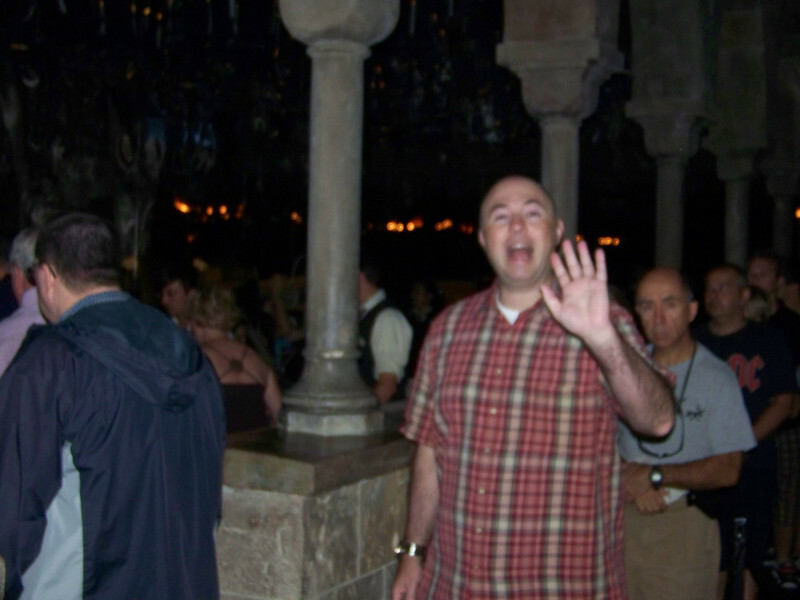 A parting look at Hogwarts. Overall, I was very impressed by the entire Harry Potter addition. Well done, Universal! Next to Harry was the Jurassic Park island. 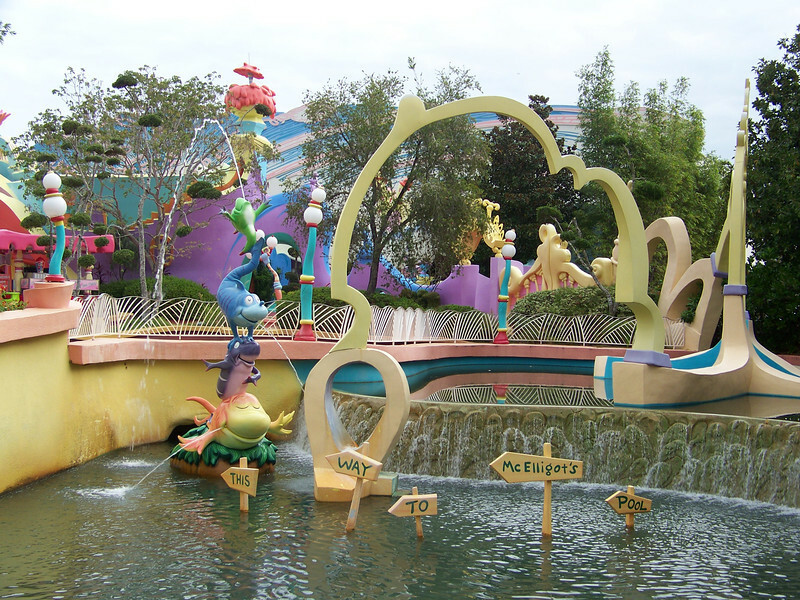 We rode the ride here back in 2000, and it's completely identical to the version at Universal Hollywood, so we skipped it this time. 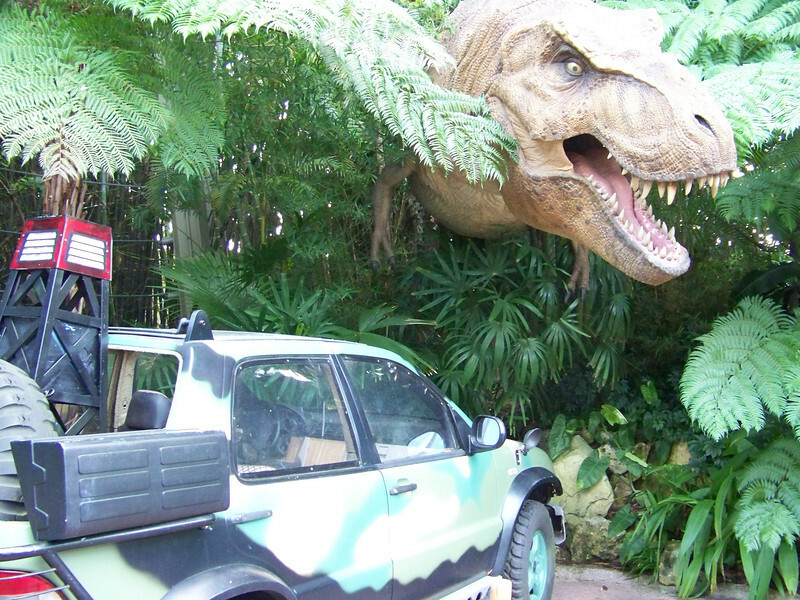 Watch out for the T-Rex!!! Don't worry, it's just a photo-op (Rex didn't move). 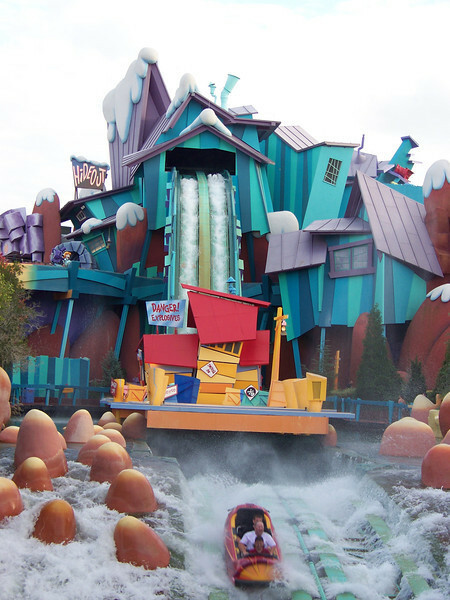 Dudley Do-Right's Ripsaw Falls are in the Toon Lagoon island. 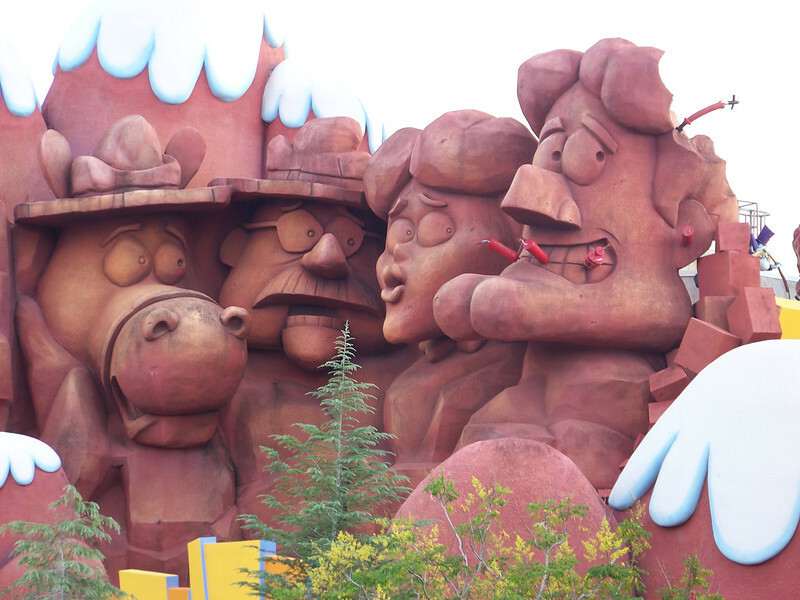 The Dudley Do-Right version of Mount Rushmore. 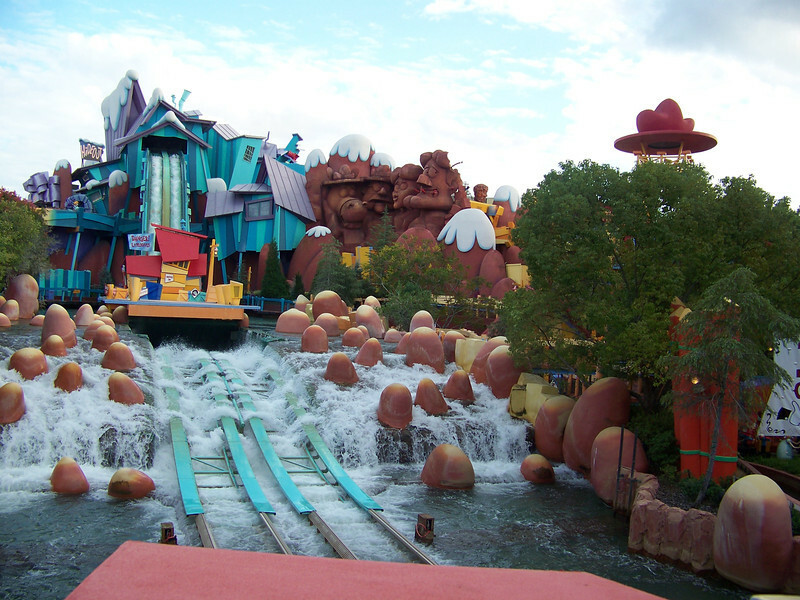 We rode Dudley Do-Right's Ripsaw Falls back in 2000. It's a cute ride, but we got completely drenched. So we skipped this one, too. 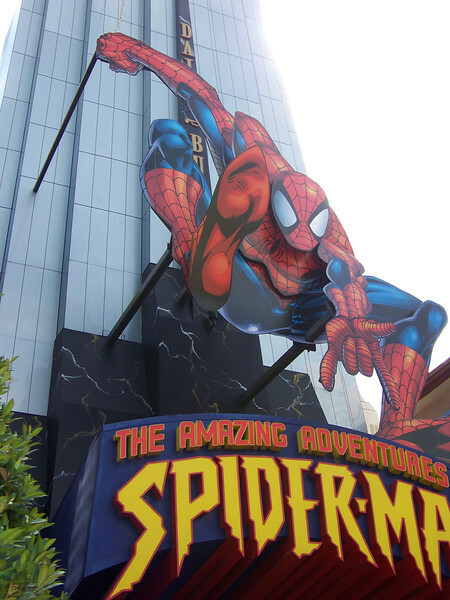 We did ride The Amazing Adventures of Spider-Man again. 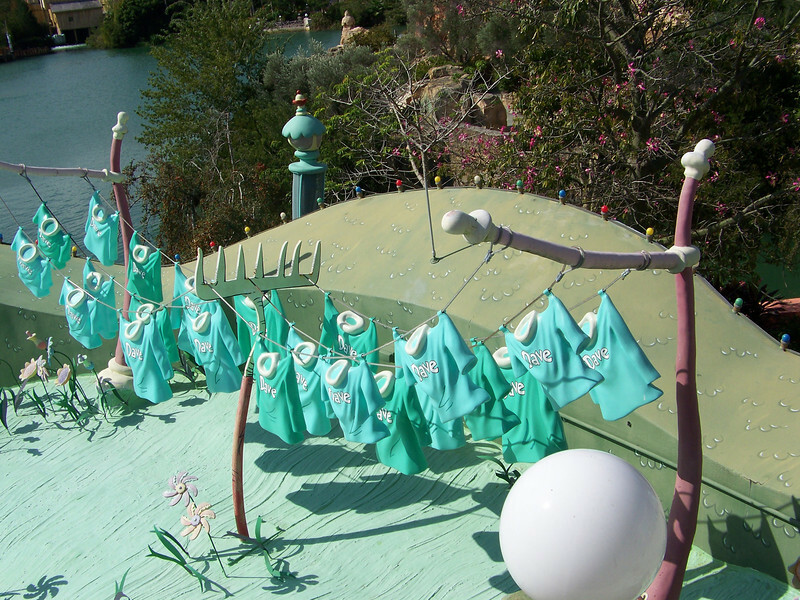 Back when the park first opened, this was the ground-breaking attraction that got all the buzz. It's held up well over the years! 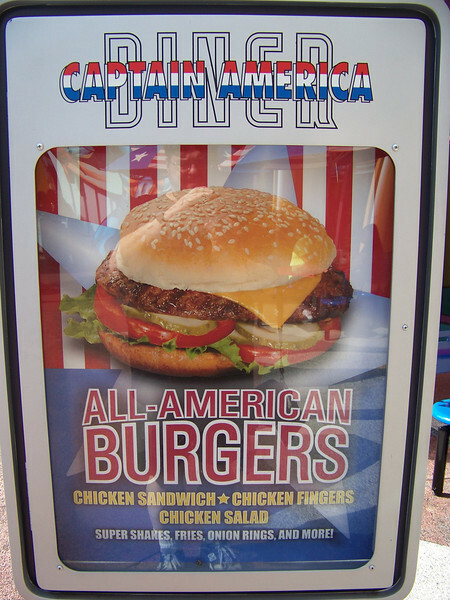 For lunch, we went to the Captain America Diner. 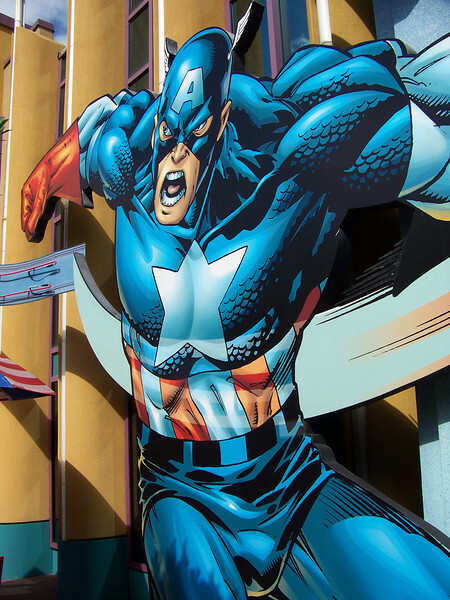 This huge picture of Captain America was on the outside of the diner. 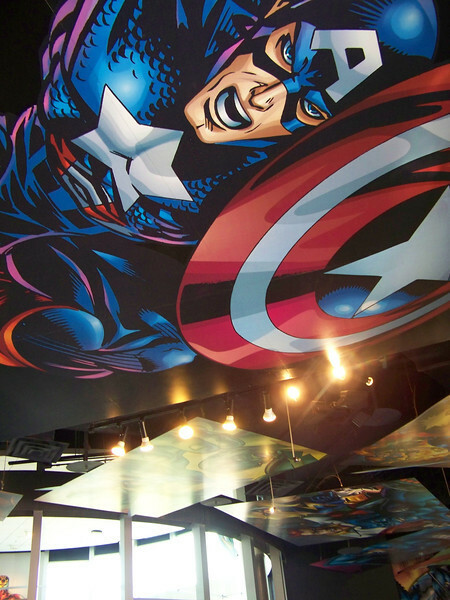 There was more artwork inside the Captain America Diner, including another large image of Cap on the ceiling. 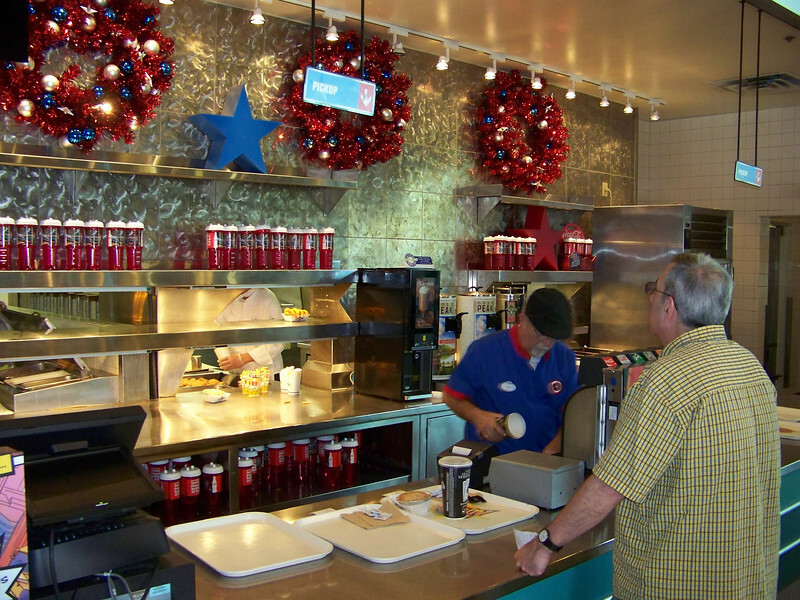 Dave ordering his lunch at the Captain America Diner. As you can see, they had already started decorating for Christmas even though this was five days before Halloween! 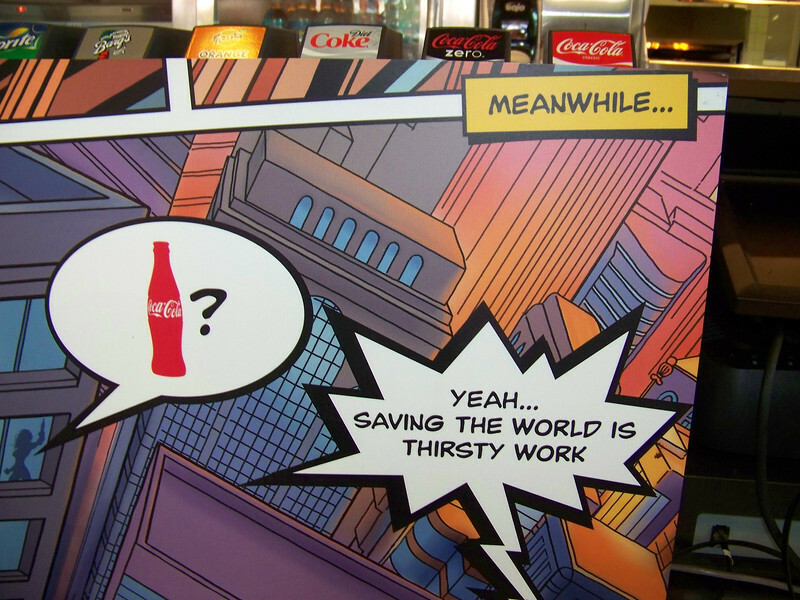 This appropriate artwork was on the backside of the pop dispenser at the Captain America Diner. 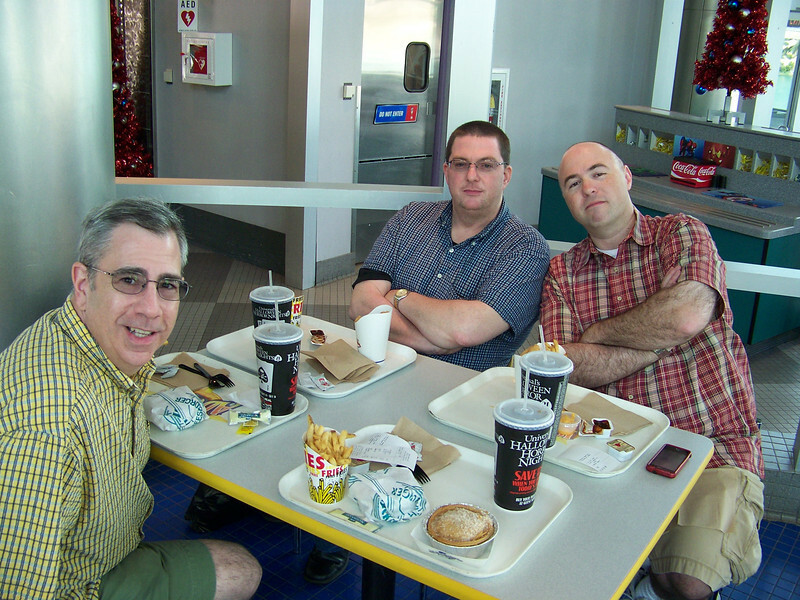 Dave, Jeff, and Pat strike heroic poses at the Captain America Diner. Note the cute (and appropriately all-American) apple pie on my tray in front. It was delicious! 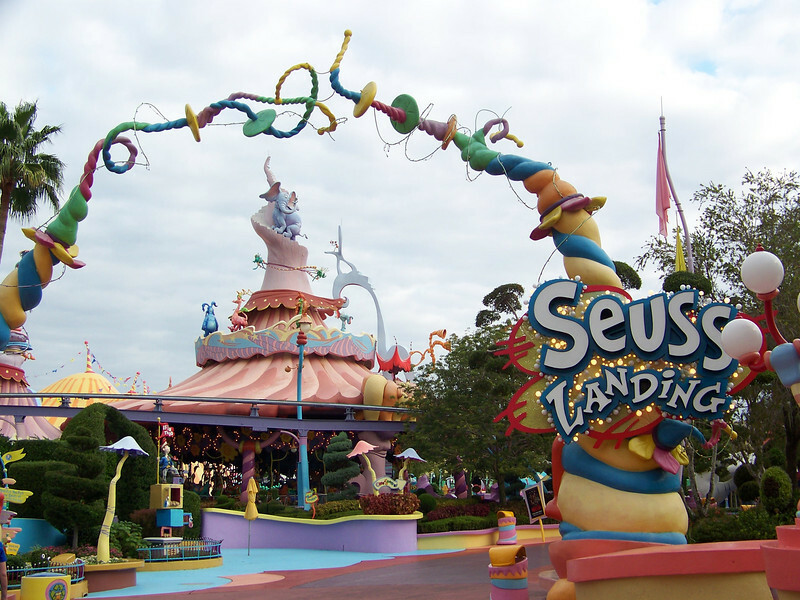 Besides Harry Potter, we spent most of our time at this park in the Seuss Landing island. 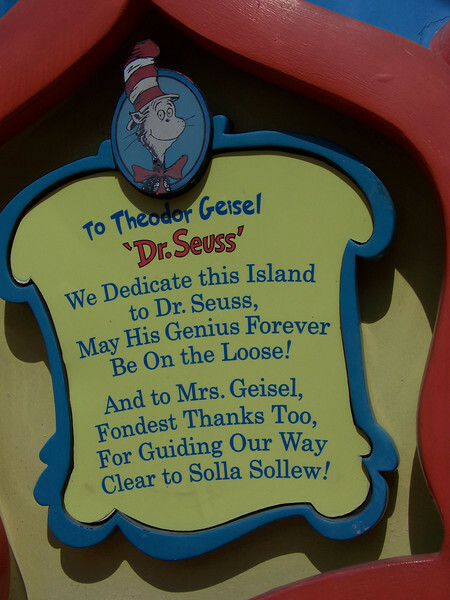 Dedication plaque to Dr. Seuss. 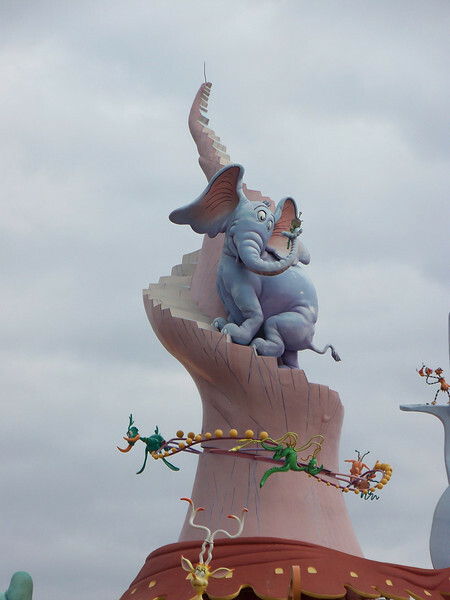 There's Horton hearing a Who. 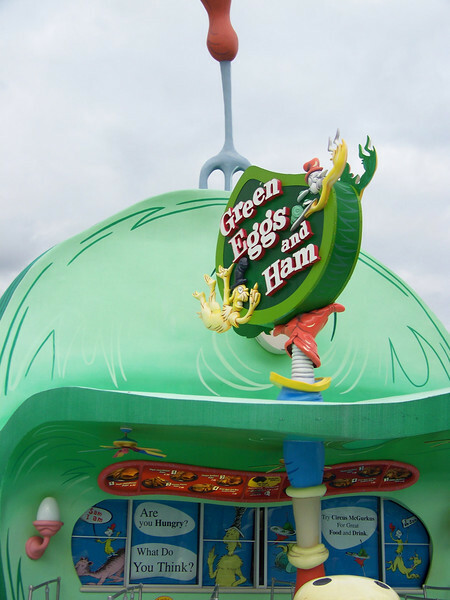 The Green Eggs and Ham cafe was closed, but I noticed on the menu that you really can get a green eggs and ham sandwich there! 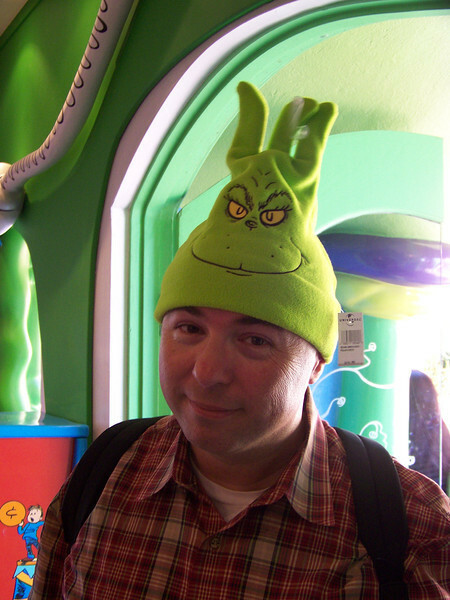 The Pat in the Hat. A train departs the station. This is a gentle four-minute ride on elevated tracks that gives you a different perspective on this area. 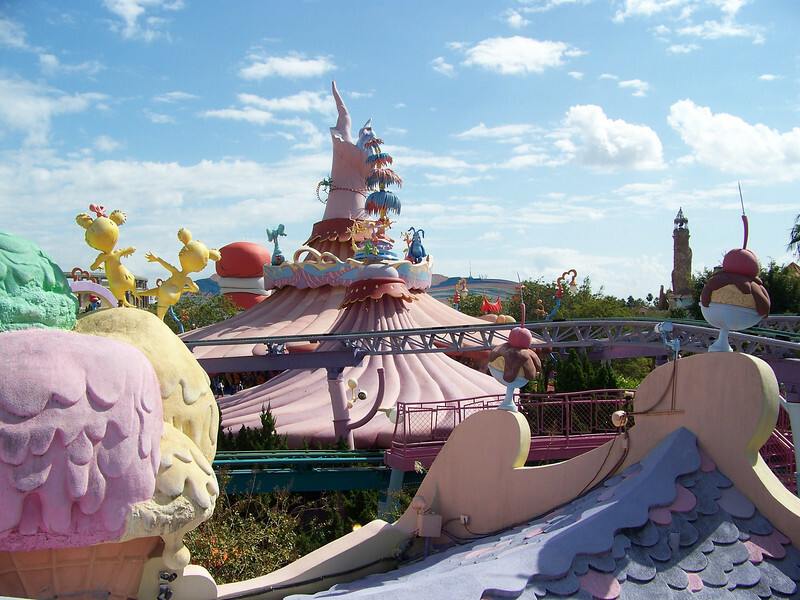 Scenes from various Dr. Seuss stories can be seen from the train. There were two different elevated tracks for the train, which take slightly different paths. 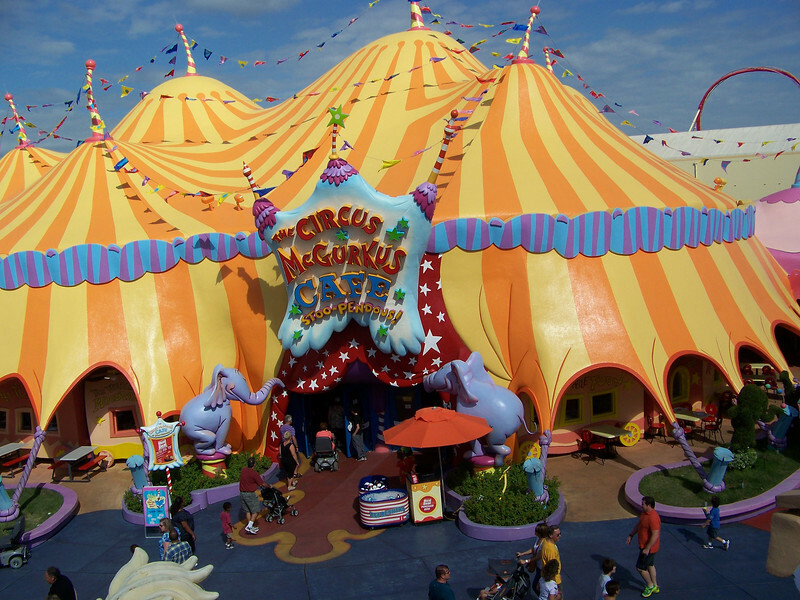 The other track actually went inside the Circus McGurkus Cafe (seen here), but we just had the exterior view. 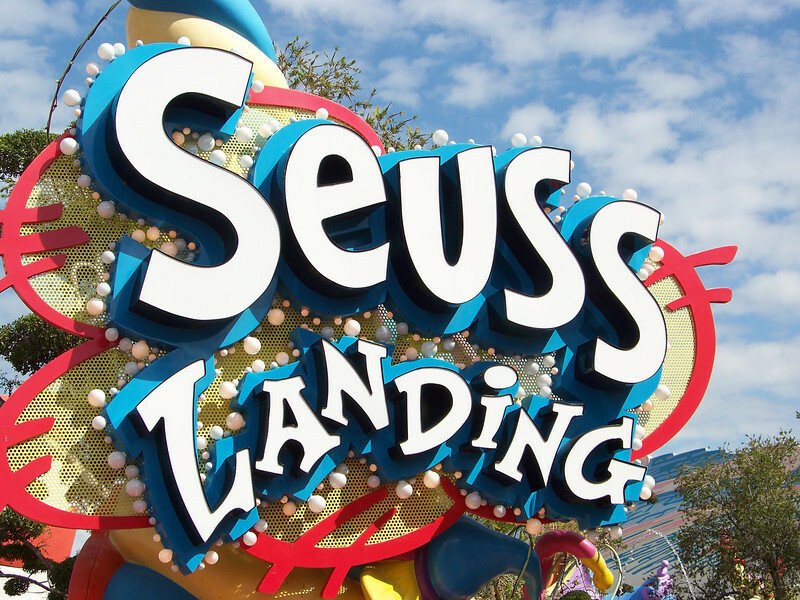 The track we were on during our train ride went around the perimeter of Seuss Landing, and provided a great view of the other areas of the park. 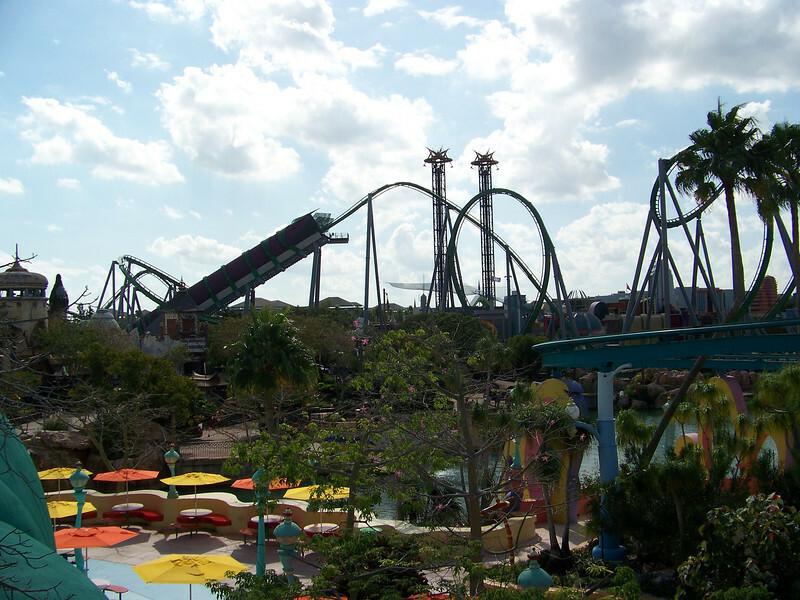 There's Marvel Super Hero Island's terrifying rides. 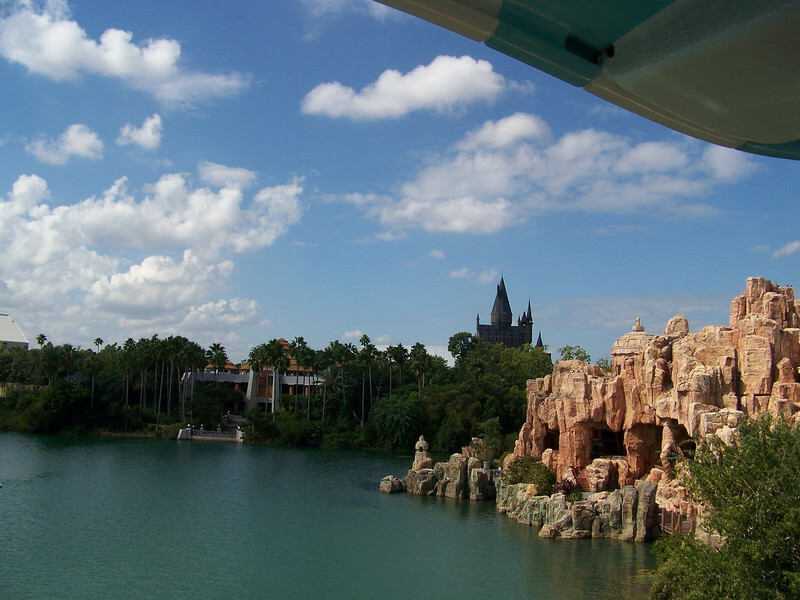 From the train you can see (left to right) the Discovery Center in Jurassic Park (we ate a quick dinner in there at the end of the day), the spires of Hogwarts in The Wizarding World of Harry Potter, and Mythos restaurant in The Lost Continent.